Did your favorite Shinola Watch stop ticking? We know the feeling, among our staff we have a number of Shinolas, but don't worry. WatchGnome offers watch battery replacment for Shinola watches and makes it fast, easy and affordable. Unlike other watch shops, WatchGnome handles the whole process for you without you having to leave your house. Get your Shinola running in just a few days without ever having to leave your house! Need Other Shinola Watch Services? No problem, we also offer crystal replacement for Shinola's as well as water resistance testing. Starting at just $20 Including Shipping.See why 1,000's of Shinola owners choose Watch Gnome. Shinola is considered a luxury, lifestyle brand which specializes in watches, bicycles, and leather goods. 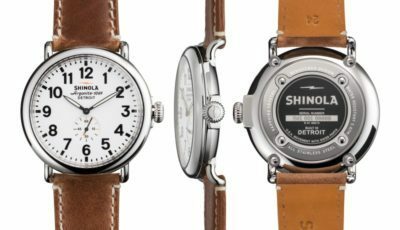 The company was founded in 2011, and the name "Shinola" is a tribute to the former Shinola shoe polish company that was manufactured in the early- and mid-20th century. The company is currently owned by Bedrock Brands, a privately owned Texas investment group. Shinola released it's first watch in March 2013. They produced a limited edition of 2,500 watches and they were available in two sizes: 1) The Runwell Limited Edition with a 47mm face sold out in only one week, with the last 40mm watch selling out in under two weeks. The watches sold for $550, and 35% of the sales came from Michigan. In October of 2013, Shinola released their second limited edition watch. It was named "The Wright Brothers Limited Edition" watch and was the first watch in the Great Americans Series. This serious was was released in conjunction with a limited edition Shinola bicycle. Again, they produced the second run of watches in 2 sizes, 40mm and 46mm, with each size available in a limited edition of 500. About a year later, in September of 2014, Shinola released The Lattice, another limited edition wristwatch created in partnership with Oscar de La Renta. This was the smalled watch so far, and was produced in 36mm as a women’s watch. The Lattice was manufactured in Detroit with only 250 produced. In 2014, Shinola released "The Black Blizzard" titanium wristwatch in 48mm and 42mm as well as the next Signature Series limited editions watch, The Henry Ford Pocket Watch. The company also produces a number of different watch styles on a non-limited edition basis, including The Birdy, The Runwell Sport Chrono, The Brakeman, The Gomelsky, The Runwell Chronograph, and The Runwell Sport. How Much Does Shinola Watch Battery Replacement Cost? With WatchGnome, you know the price before you even get started! Check out our watch battery replacement prices today! Shinolas are the same price. And if you order our service today - You'll save $5.00! Getting your Shinola watch battery replaced for only $35 with out even having to leave your house is a great deal, so don't wait! WatchGnome is proud to offer Shinola watch battery replacement. We love their products and are always excited to see one arrive in our mail order watch battery replacement boxes!